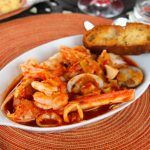 I have served versions of this Cioppino for holidays, family celebrations, or just because and every time we have it everyone raves about it. There is something about seafood that makes a meal special. 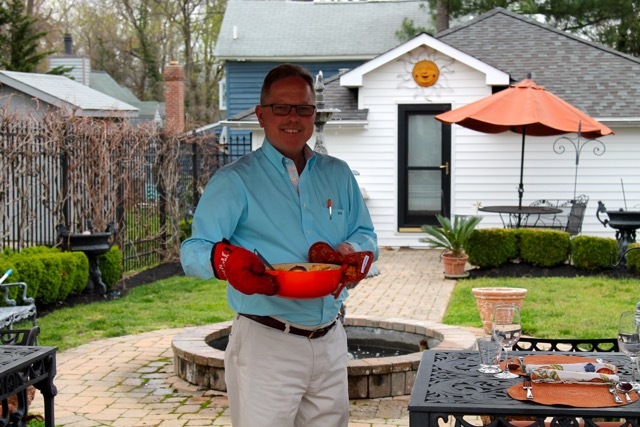 Now that spring is here and Steve has installed a stationary canopy to his outdoor kitchen, that replace the the umbrellas, he is ready to entertain! 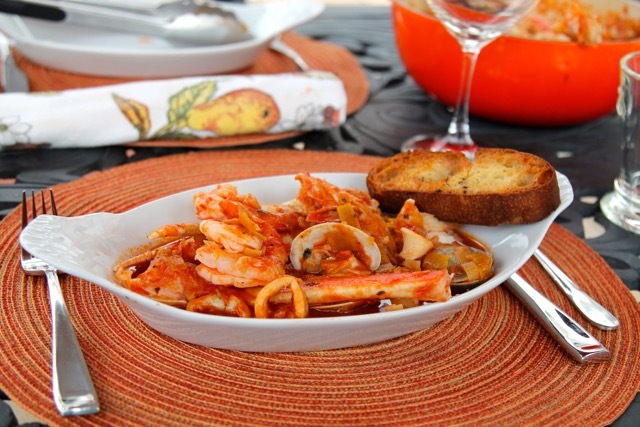 This American version of the Italian seafood stew is elegant and easy. Make the broth up to three days ahead of time and refrigerate then prepare the seafood, add it and serve with crusty bread and a green salad. How easy is that? We encourage creativity with the seafood mix to compliment your taste and the selection available to you at your local fish market. I tend to load up on shellfish but feel free to use any type of mild fish that appeals to you. 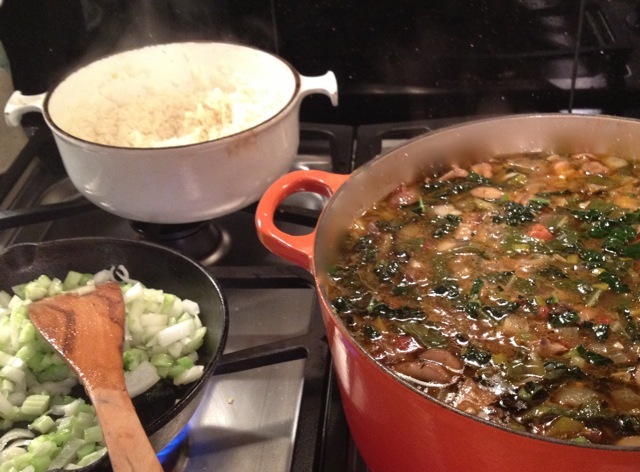 This stew is very forgiving so enjoy and be inspired! Play with the spices and red pepper to suit your taste, but only in small additions so you don’t overpower the balance of flavors. Heat the olive oil in a 6 quart dutch oven or heavy pot. Add the leeks and sauté over med/low heat until melted, about 5-7 minutes. Add the garlic, red pepper, oregano, salt, pepper and bay leaf and sauté 1 minute. Stir in the tomato paste and continue to cook, stirring for another minute. Add the wine and bring to a boil. Continue to boil until reduced by half, maybe 5 minutes. Add the tomatoes along with their juice, the fish stock and simmer for 20 minutes to a ½ hour. Add the calamari, clams and mussels to the simmering broth, cover. 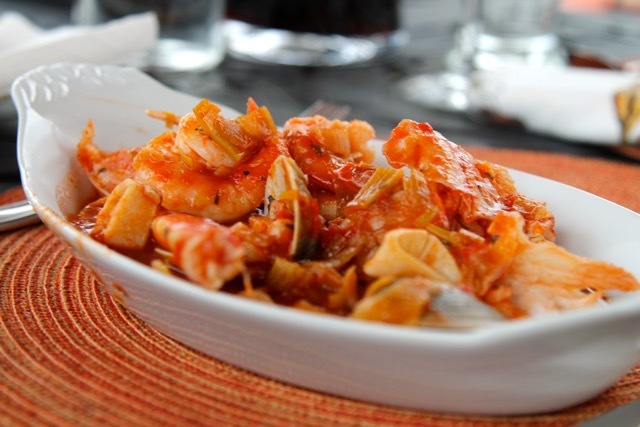 After 5 minutes remove the cover and start to transfer the opened clams/mussels to a large bowl with a slotted spoon. After 10-12 minutes discard any unopened shells. Continue to cook the calamari for 5-10 minutes or until it becomes tender (calamari is very rubbery if not cooked for a total of 20-30 minutes). Add the shrimp and scallops and cook until the shrimp just turn pink, 4-5 minutes. Add the mussels and clams to the pot; discard the bay leaf and serve. Sprinkle each serving with the chopped parsley/basil, and enjoy! Note: Feel free to add vegetables to the mix. 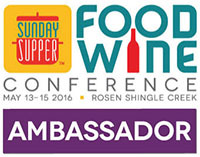 Sometimes I use small fingerling potatoes, swiss chard and fresh asparagus. It is a great way to add color & texture to the stew! *Beware: The crabs are amazing in the stew but they are messy to eat. if you have an elegant dinner you may want to skip the crabs or if you keep them offer little bowls of lemon water to wash off your fingers. Thank you Claire McEwen of Sprinkles and Sprouts for hosting our event! Oh, my! I’d risk the mess and add the crab–what an exquisite recipe. 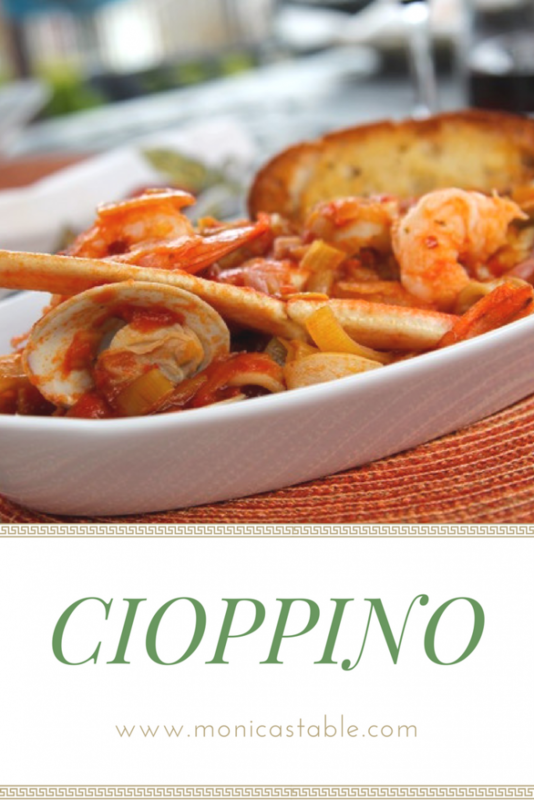 I adore cioppino but have never made it!! It is so easy! If you do make it everyone will be so impressed and they think you slaved over it. I do agree about the crab – it’s totally worth the mess!!! Thanks for stopping by Arlene! I love that this is a dish anyone can make their own! Seafood is so versatile! Yes – it is versatile and it always turns out to be amazing – as long as I don’t over cook it! 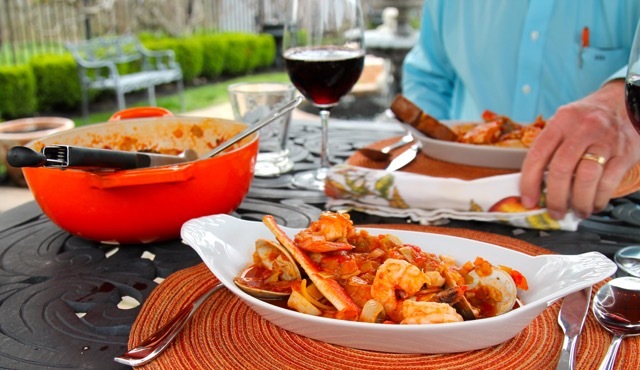 Hi Monica, this cioppino looks delicious, love how you spiced it up. 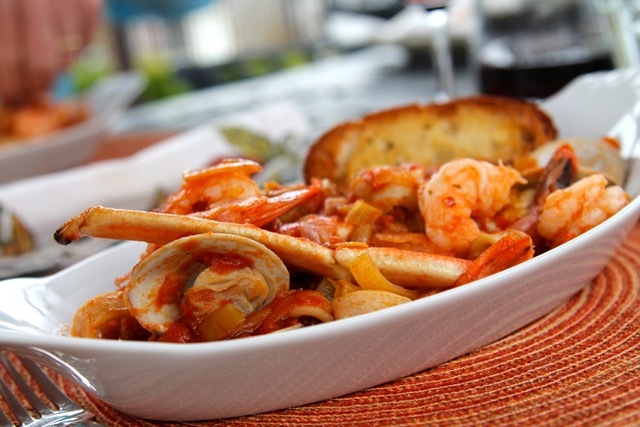 I remember having cioppino in a local restaurant and it was so flavorful and comforting – yours looks like a delicious dish. That’s so nice you have an outdoor kitchen! This looks wonderful. My husband love this! We are so excited that Spring is here and we can start to use the patio. It’s so depressing when we close it down for the winter – it’s like we loose a room of the house. This is an amazing dish! I have not made it before, but looks like something I would love to try! That crusty bread and dining outside! Perfect meal! I haven’t had cioppino in forever! I first had it in San Francisco and fell in love with it and sourdough all in the same meal!